solvers." Daniel Jaye, Principal Bergen County Academies, Hackensack, NJ Help students become skilled and confident problem solvers! 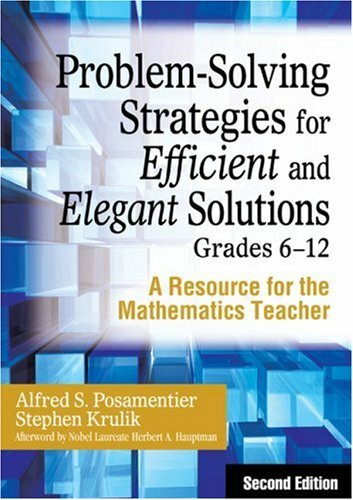 Demonstrating there is always more than one approach to solving a problem, well-known authors and educators Alfred S. Posamentier and Stephen Krulik present ten basic strategies that are effective for finding solutions to a wide range of mathematics problems. These tried-and-true methodsincluding working backwards, finding a pattern, adopting a different point of view, solving a simpler analogous problem, and making a visual representationmake problem solving easier, neater, and more understandable for students as well as teachers. Providing numerous sample problems that illustrate how mathematics teachers and specialists can incorporate these techniques into their mathematics curriculum, this updated edition also includes: A variety of new problems that show how to use the strategies References to current NCTM standards Solutions to the problems in each chapter Extensive discussions of the empowering strategies used to solve sample problems The second edition of Problem-Solving Strategies for Efficient and Elegant Solutions, Grades 612 helps teachers develop students' creative problem-solving skills for success in and out of school. committee responsible for preparing the Professional Standards for Teaching Mathematics of the National Council of Teacher of Mathematics (NCTM). He was also the editor of the NCTM's 1980 yearbook Problem Solving in School Mathematics . He is the author or co-author of more than 20 books for teachers of mathematics, including Assessing Reasoning and Problem Solving: A Sourcebook for Elementary School Teachers . He has served as a consultant to and has conducted many workshops for school district throughout the United States and Canada, as well as delivering major presentations in Austria, Hungary, Australia, and international professional meetings, where his major focus is on preparing all students to reason and problem-solve in their mathematics classroom, as well as in their lives. Krulik received his BA degree in mathematics from Brooklyn College of the City University of New York, and his MA and EdD in mathematics education from Columbia University's Teachers College.